I am a painter, etcher and printmaker. The underlying theme in my work is the influence of Time on Nature; the way that layers are deposited in a sedimentary, seemingly random pattern. In the last 18 years, I have moved from Cornwall, to Chicago, and finally to Farnham. The move to Chicago I found especially stimulating. Since settling in Farnham I have built my own studio and print room, and qualified as an art teacher. I am an active member of the Borderlands Artists Consortium and Farnham Arts Society. Recent work is exemplified by Borders and Bulrushes. This includes a series on borders and boundary lines, using different materials to blur the boundaries, on the one hand, or, on the other, to define borders. The Bulrushes series reflected a contemplation on time and place. Tropical Tides is the title for work inspired by exhibits at Haslemere museum. Two other series of works featured on this website I have called Emergence and Sense of place. Emergence is a series of three pieces inspired by one of Henry Moore's drawings. Sense of place consists of six pieces produced for an exhibition at St Andrews Church, Farnham, and drawing on the history and atmosphere of this lovely building and its surroundings. Earlier work was based on images drawn from my dreams - seascapes and landscapes - but also the very impact of light on optic nerves. 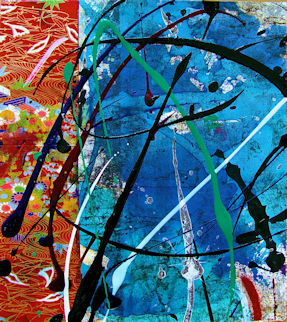 This is exemplified in a series of mixed media paintings I have called Opto-sense. Also, studies of complementary colours have led to a series of quasi-abstract depictions of flowers and night gardens. I drew inspiration for these series from a visit I made to Japan, which shows not only in the horticultural aspect, but in other ways, for instance the incorporation of Japanese decorated papers.